Please the whole table with this Sofrito Chicken recipe. A Puerto Rican favorite, this delicious Sofrito Chicken is also a Healthy Living recipe! Heat dressing, onions, garlic and annatto in large skillet on medium-high heat 2 min. Add peppers, tomatoes, ham and cilantro; cook 5 min., stirring constantly. Reduce heat to medium. Place chicken on tomato mixture; press lightly. Cook 10 min. Carefully turn chicken over so that tomato mixture sticks to chicken; cover. Cook 15 min. or until chicken is cooked through (170°F). Sofrito is a staple in all Puerto Rican kitchens. There are as many ways to prepare this multi-purpose condiment as there are cooks on the island nation! Sofrito can be purchased ready-made in stores that sell Hispanic groceries. Omit onions, garlic and annato. 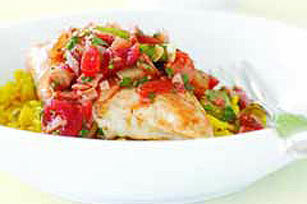 Pour KRAFT Zesty Italian Dressing into skillet, add jarred sofrito and top with chicken breasts. Continue as directed. Never allow cooked chicken to sit at room temperature for more than 2 hours. If it is not eaten immediately, cooked chicken should be kept hot or refrigerated. Great served with hot cooked yellow rice.